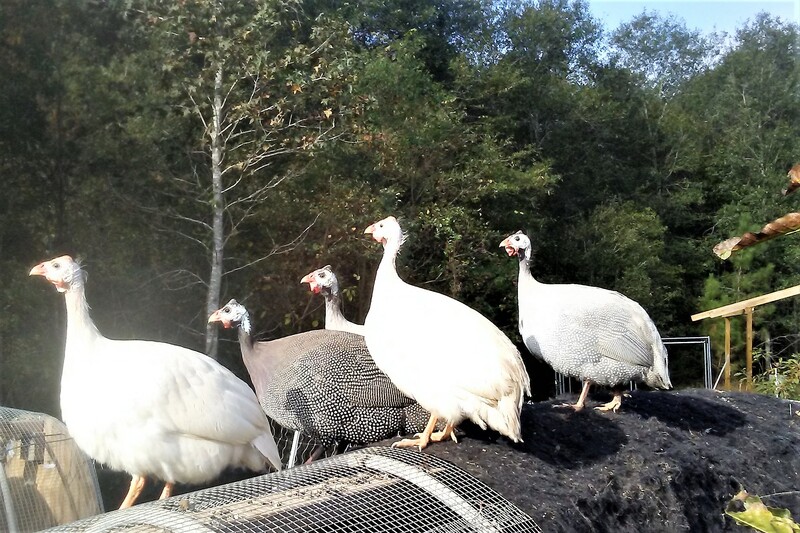 Keeping guinea hen is great for the farm, but the steep learning curve on continues…………..
We have lost some guinea hen to predators. Best guess – Owl. I will trap raccoons, but I will never hurt an owl. So this is a management issue. We believe it is owl, because we have seen a large owl and there are no foot prints. Yes we have seen hawk by day, but guinea hen are very alert. Chicken are relatively easy to surprise and hawk can pick them off just fine. That is why the chicken live in chicken tractors. Guinea hen on the other hand look to the sky much more frequently and run screaming a the first sign of danger. So far we have had no losses during the daytime and this has allowed groups of chicken to free range as the guinea hen alert the chicken too. The issue seems to be at night for smaller guinea hen. The larger birds pictured above may seem too big for an owl preferentially target, so these birds have been untouched. But we have released 5 smaller guinea hen and now we are down to 1. Each time there has been a small pile of feather left and no foot prints. Researching the topic on line indicates that the birds have poor night vision. Having seen a large owl in the trees near by, we may have a suspect. Having noted that the larger birds are not taken but the smaller ones are, that leads to a management plan – releasing the birds to total freedom later in life. It is important to us that we have some birds totally free as they are our primary source of insect control. We do not use synthetic pesticides, the guinea hen are our prime method of bug control and they are doing a pretty good job of it. Going forward we need to find the optimal release size for the birds.